The cupcake wars have been fought, and New York can wage its doughnut battles—we’ll gladly take the refreshing, fruity and portable popsicle as the next great dessert explosion. Long the province of paleta- and Good Humor–men, the dripping, summery treat has entered the pastry chef’s lexicon at places like Bleeding Heart Bakery (1955 W Belmont Ave, 773-327-6934), which is promising to produce flavors such as blueberry-peppercorn and lemon-rosemary this summer. And it has even found its way into plated desserts like “The Brazilian” at Perennial (1800 N Lincoln Ave, 312-981-7070): brown-butter cake and pineapples sautéed in cachaça, paired with ginger popsicles brightened with lime zest. But perhaps the best thing about a popsicle trend is that you don’t necessarily need a restaurant to participate. As this Pineapple-Thai Chile-Cinnamon Popsicle recipe (below) shows, all you need are some tongue depressors and Dixie cups. 1. Heat oven to 350 degrees. Place two cinnamon sticks on a baking sheet, and toast in the oven for about five minutes, until fragrant. Finely chop four Thai chiles, and combine in a small saucepot with a half cup of water, half cup of sugar and toasted cinnamon sticks. Bring to a boil, then turn off heat, cover, and let sit overnight for the flavors to infuse. 2. Chop one pineapple, discarding core. Puree cut pineapple with a half cup of the cinnamon-chile syrup (discard the cinnamon sticks) in a blender. Blend on high until smooth. 3. Strain the pineapple liquid through a fine-mesh sieve. Pour into popsicle molds or three-ounce Dixie cups. Cover thoroughly with plastic wrap, insert sticks (poke through the plastic wrap) and freeze overnight. 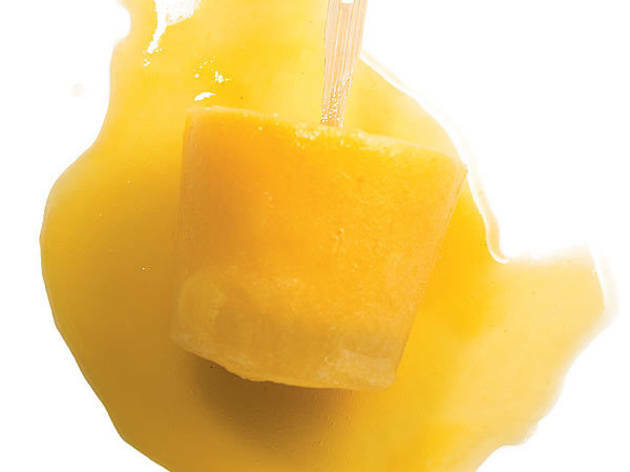 For hotter popsicles, add additional Thai chiles; for milder popsicles, strain the simple syrup. 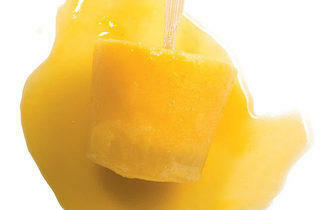 Depending on how sweet the pineapple is, you may want to increase or decrease the amount of simple syrup.